This DIY provides the basic procedure, in a video and in words, for replacing the front hub and wheel bearing in a 2000-2011 Ford Focus without removing the steering knuckle and without using a standing hydraulic press machine. 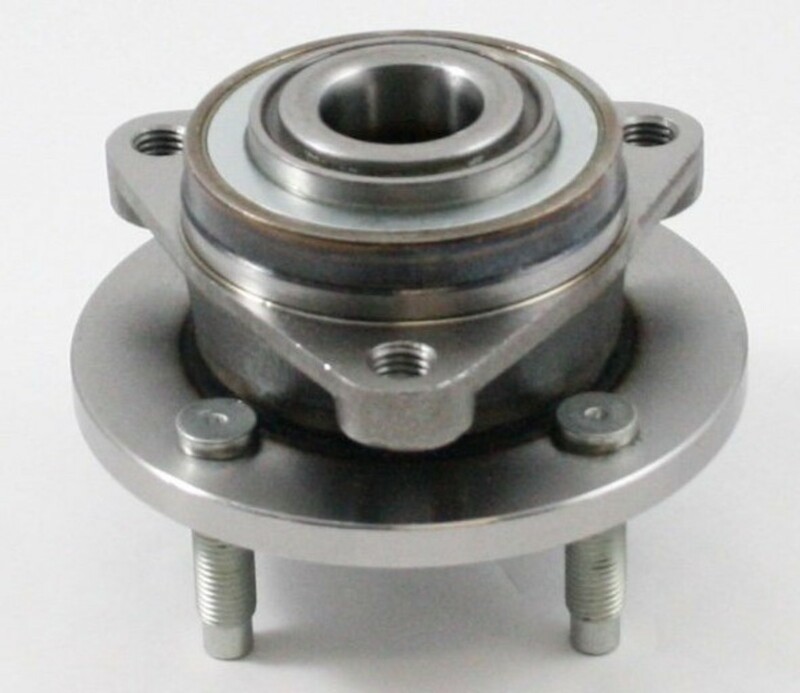 In the Focus, the bearing is press-fitted into the steering knuckle, and the wheel hub is press-fitted into the inner race of the wheel bearing. 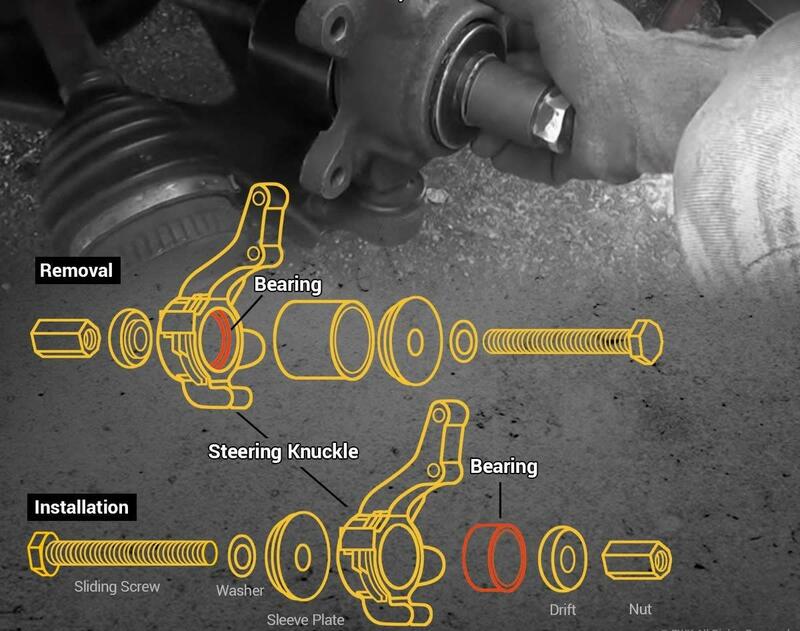 The procedure for replacing FWD pressed-fitted steering knuckle bearings is basically the same for most cars with this configuration with minor differences. 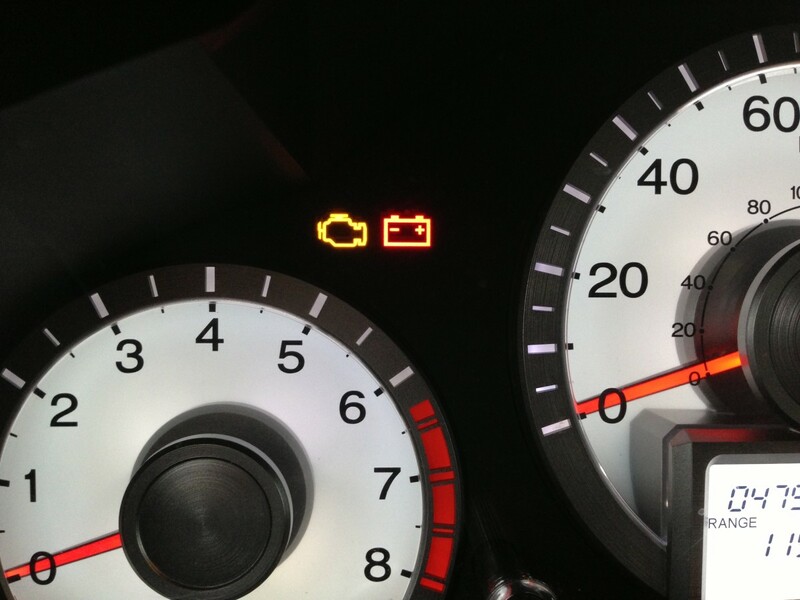 Therefore the basics of these instructions can be used on other vehicles besides the Focus. Having found in several repairs that the wheel hub was worn as well the bearing, I now replace the wheel hub as well in every bearing replacement job. 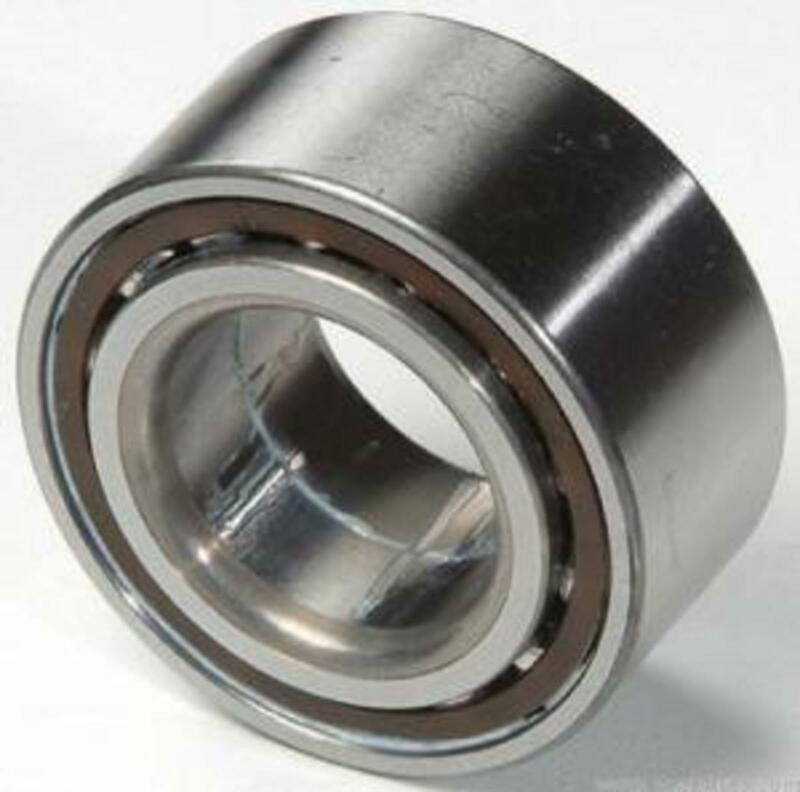 Replacement bearings can be purchased as a kit, and the extra cost of the hub is nominal. Note: If you are not using a FWD bearing installation kit or a standing hydraulic press, don't try to "hammer" a bearing into the steering knuckle with makeshift bushings. This will most likely ruin the bearing in a matter of a few weeks. Bearings must be pressed in, not hammered in. 1. A front-wheel-drive wheel hub puller with a slide hammer. 2. 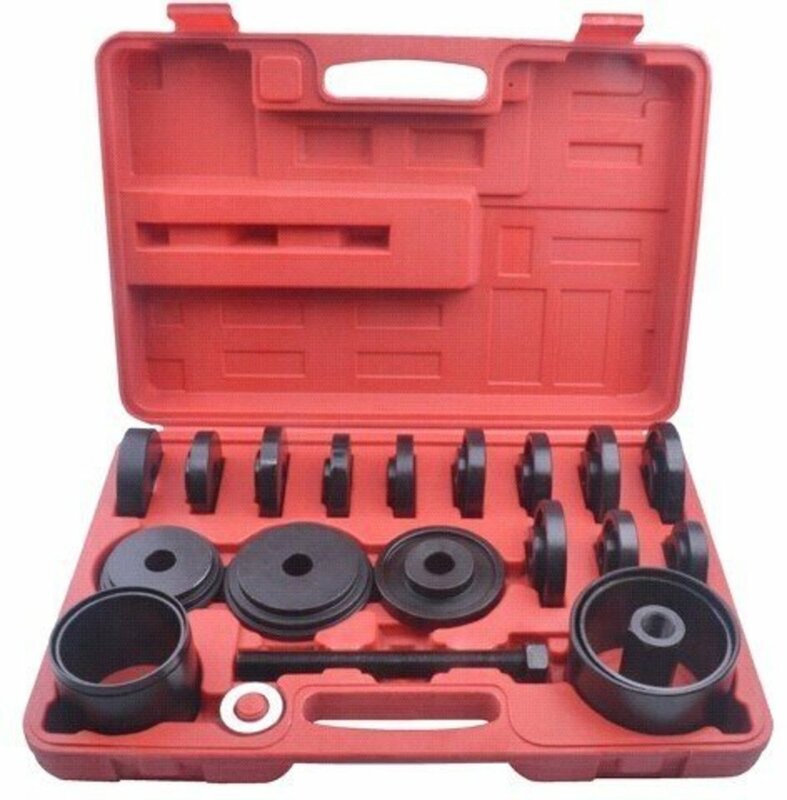 A front-wheel-drive bearing removal and installation tool kit, also called "bearing adapter kit," "bearing press tool kit," or "bearing puller kit." 3. A high-torque air or electric impact driver. Attempting to perform this task without this tool would be difficult, timing consuming and tiring. The seven-minute video will provide you with visual step-by-step help for completing this replacement. The steps are also described lower down in the article. Here are the steps you need to follow to complete the replacement. Remove the two (2) bolts that hold the brake caliper assembly to the steering knuckle. Support the assembly so that there is no stress on the brake hose. Remove the brake rotor. If it is stuck, apply hammer blows between the rotor's wheel lugs to vibrate the rotor loose from the wheel hub. Remove the CV axle nut from the CV axle. An air or electric impact tool will make the task go faster and easier. This nut may be torqued on at 230 lbs. 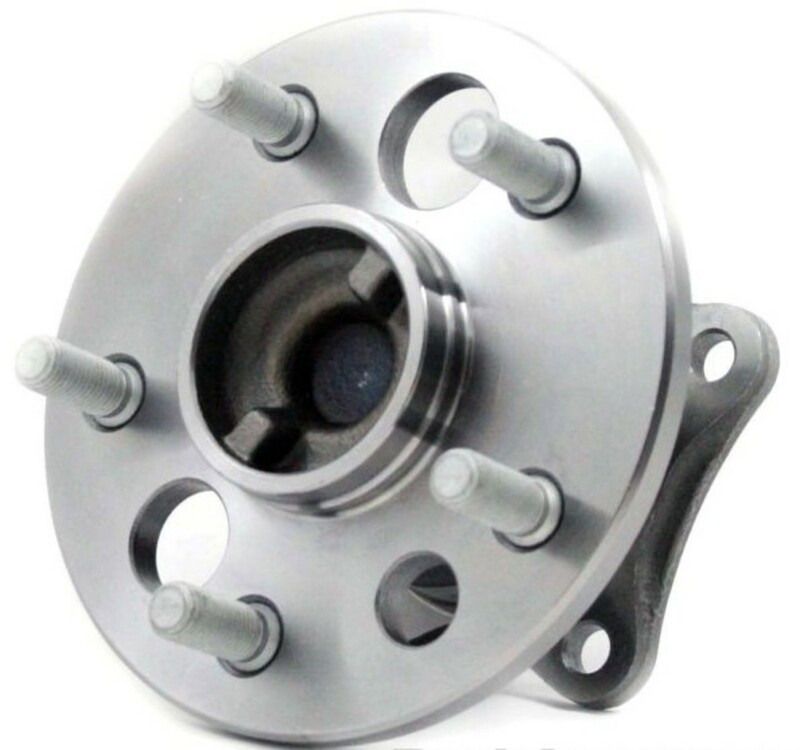 If the wheel hub is very worn, the hub may fall off into your hands after you start wiggling it. If this happens, continue onto "Detaching the Suspension Strut and Tie Rod End" below. Otherwise, continue with this section. 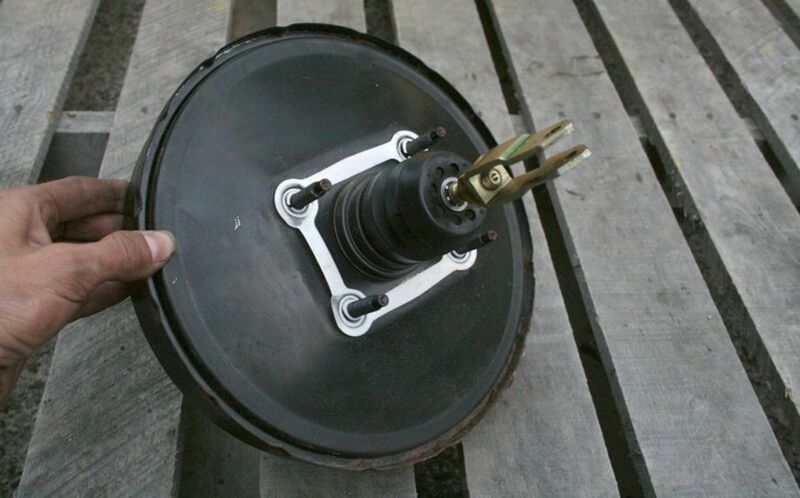 Attach the hub puller tool to the wheel hub using the wheel lugs. 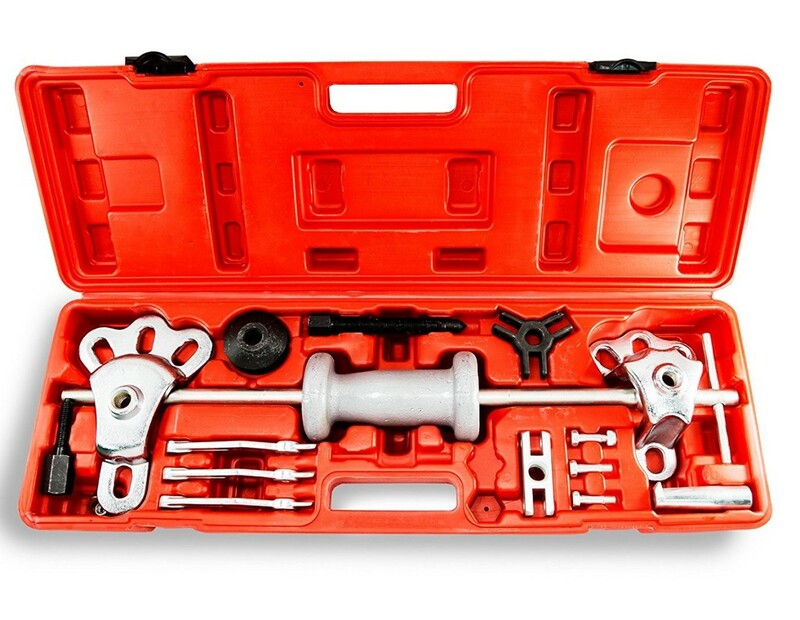 Secure the hub puller tool with the lug nuts. Screw the slide hammer shaft onto the hub puller Tool. 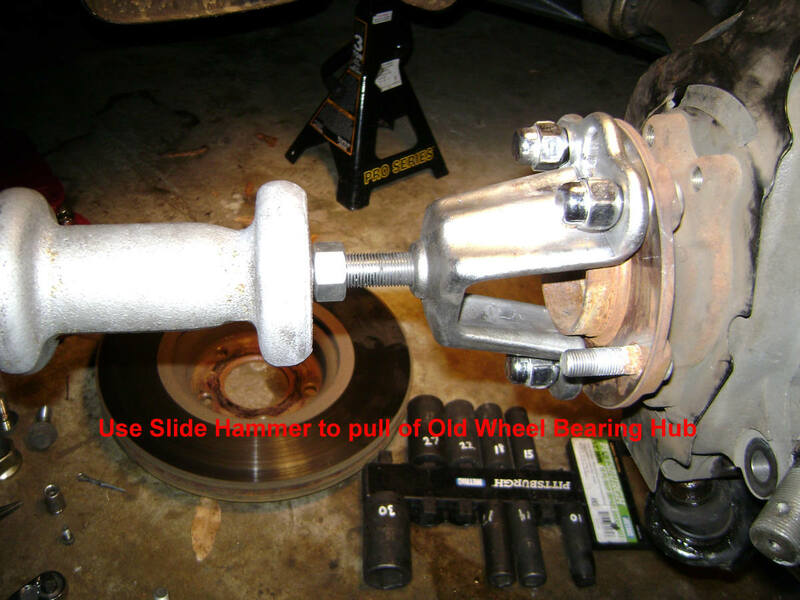 Apply fast, hard tugs with the slide hammer to pull the wheel hub away from the wheel bearing's center race. When the wheel hub comes off, the bearing's outside center race will be attached to the shaft of the wheel hub. 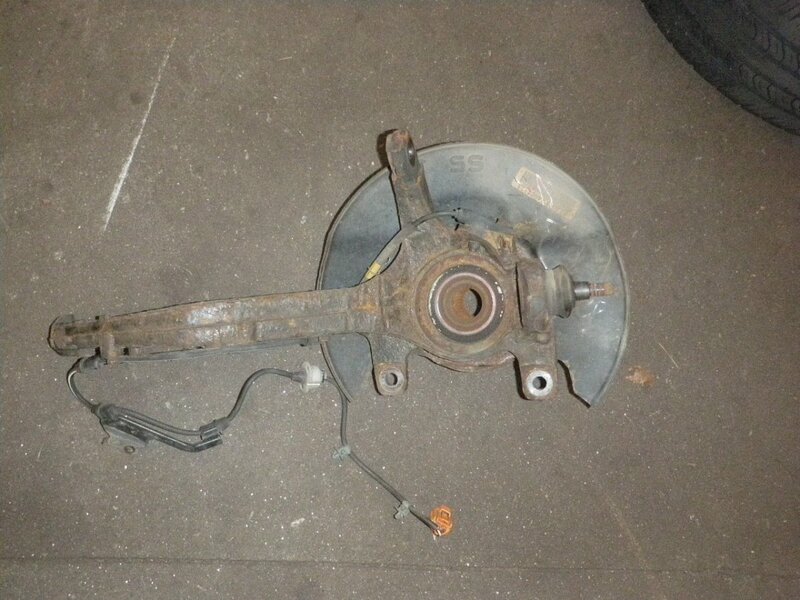 See the picture below of the setup used to remove a wheel hub from a Toyota Corolla. The concept is the same. Slide Hammer attached to the Wheel Hub Removal Tool attached to the lugs of the Wheel Hub. 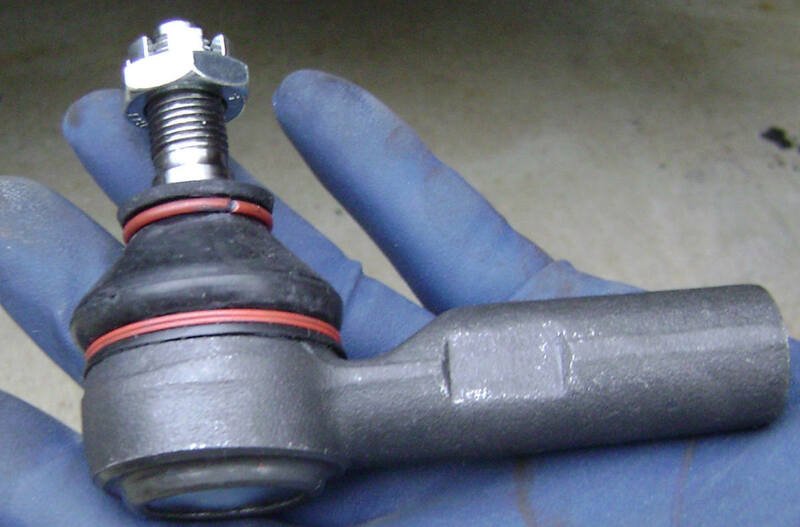 Remove the cotter pin from the tie rod end. Remove the castle nut from the tie rod end. Apply hammer blows to the steering knuckle where the knuckle joins the tie rod end. The vibration from the blows should break free the connection. Remove the suspension strut bolt from the steering knuckle. Apply hammer blows to the top of the steering knuckle to separate the knuckle away from the suspension strut. Pull the CV axle shaft away from the steering knuckle hole. Remove the snap ring out of the snap ring groove of the steering knuckle. 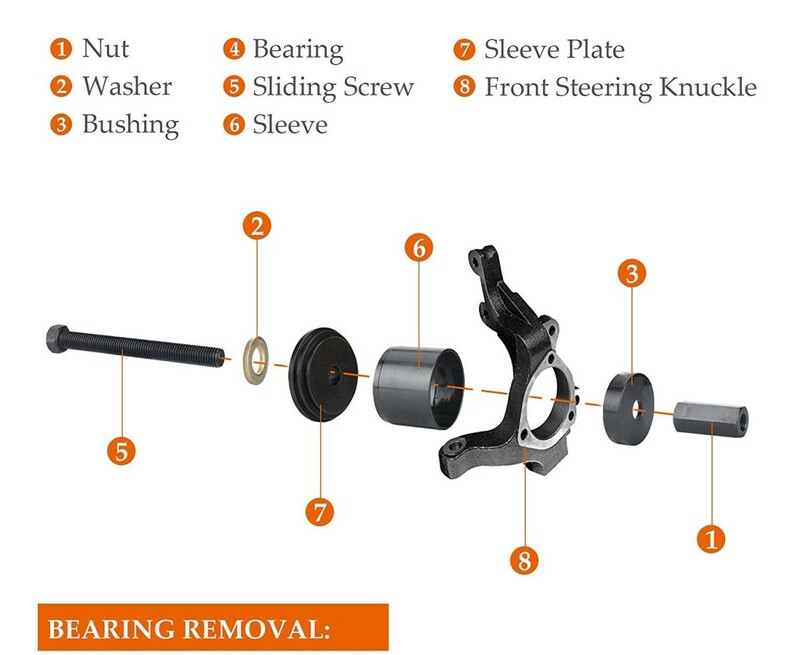 Review the diagram below this section to see the parts and tools involved in removing the bearing. a. Select the adapter from the tool kit that is closest to being the same diameter as the bearing. b. Select the bearing sleeve from the tool kit that will capture the bearing when the bearing is being pressed out. 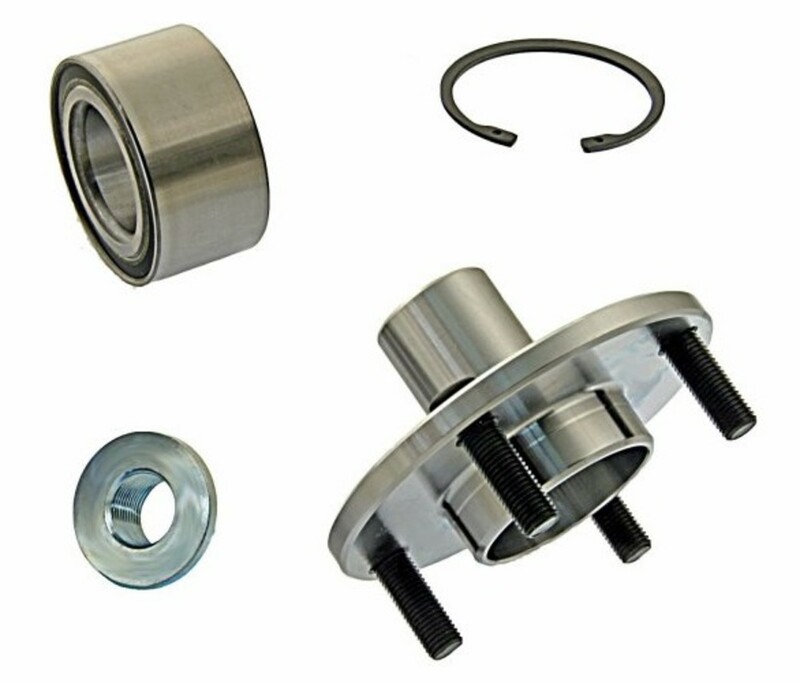 The bearing sleeve must be large enough to fit flush against the steering knuckle. c. Get the sleeve plate from the tool kit that will fit onto the bearing sleeve. d. Assemble the components in (a) (b) and (c) above, using the sliding screw, washer, and slide screw long nut. Make sure the bearing sleeve is mounted where the bearing can come out: that is, through the side where the snap ring was removed. 2. Using a powered impact tool and wrench, begin torquing the bearing out of the steering knuckle. Eventually the bearing will "pop" into the bearing sleeve. Review the diagram below this section. a. From the tool kit, find a bushing with the same outside diameter as the new bearing. Note: The bushing CANNOT be larger than the diameter of the steering knuckle bearing mounting hole. If it is, the new bearing cannot be fully pressed into the steering knuckle. b. From the tool kit, get the sleeve plate that is larger than the steering knuckle bearing mounting hole. c. The new bearing should be sandwiched between the bushing and the steering knuckle bearing mounting hole. Ensure the bearing is positioned at the rear opening of the steering knuckle. d. Assemble the components in (a), (b). and (c). together using the sliding screw, washer, and slide screw long nut. 2. Begin pressing the the bearing into the steering knuckle with a powered impact driver tool. You will know the bearing is fully seated when the impact driver suddenly struggles to keep turning. That is, the rotational force will suddenly stop. 4. Install the new snap ring. 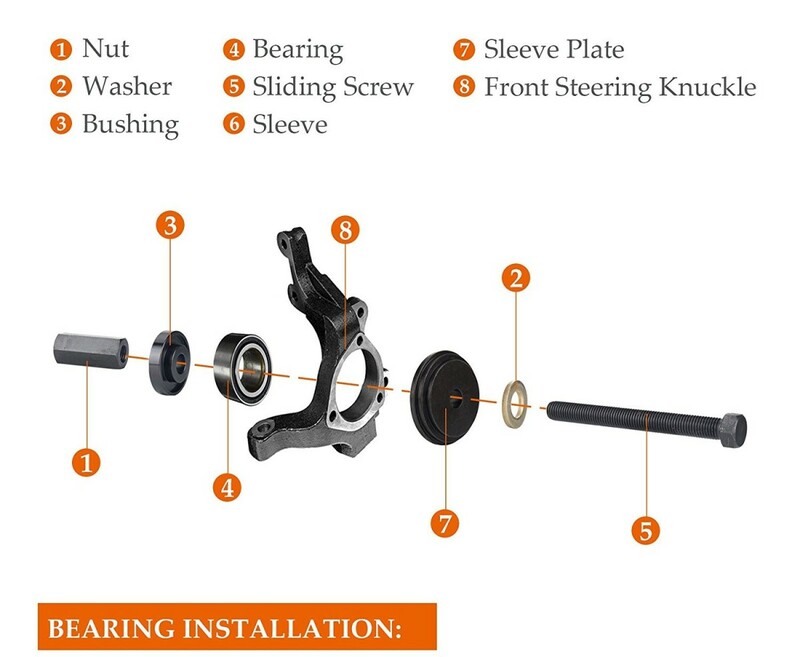 Get a bushing from the kit of the same or smaller diameter as the wheel bearing. Get a bushing from the kit that has a larger diameter than the wheel hub ring. 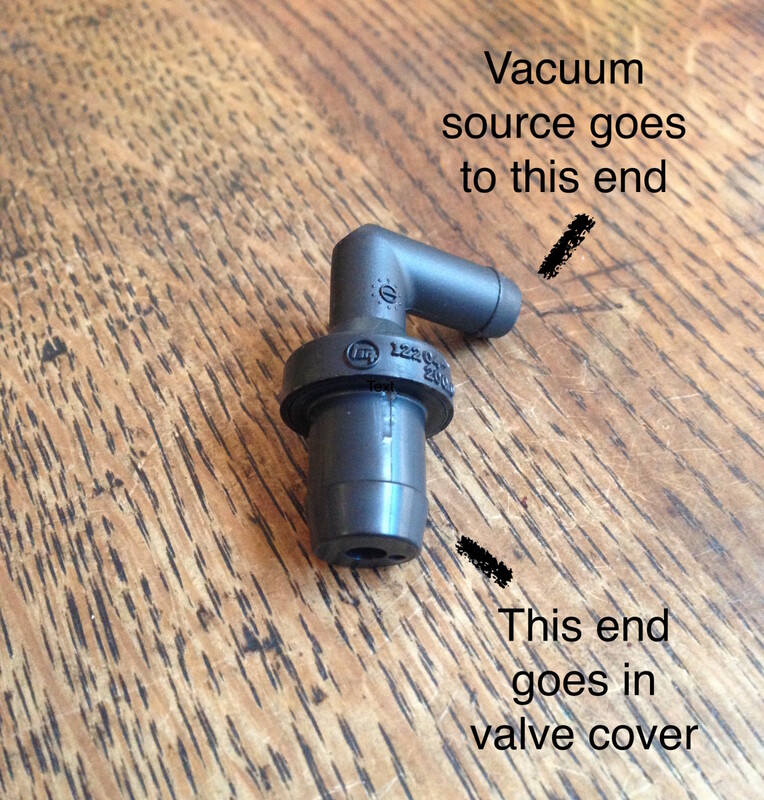 Attach the components together using the sliding screw, washer and slide screw long nut. Torque and press the shaft of the wheel hub into the inner race of the wheel bearing until the slide screw nut stops moving. disassemble the components. The wheel hub is partially installed. The hub will be fully pressed in when the CV nut has been torqued down, which will be covered in the section to follow. Push the CV axle through the wheel hub. Connect the steering knuckle to the suspension strut and torque down the strut-to-knuckle bolt. Screw on the new CV axle nut bolt. When torquing the CV axle nut down, the wheel hub shaft will move through the inner bearing race until it reaches the base of the CV axle shaft stop point. At this point, the wheel hub is fully seated. Connect the outer tie rod end to the steering knuckle with the castle nut. Torque the castle nut down and insert the cotter pin. Install the brake rotor and hold it in place with a lug nut. Install the brake assembly over the brake rotor and bolt the assembly to the steering knuckle. Attach the brake hose to the suspension strut.